Interior design project for a coastal apartment in Cornwall. 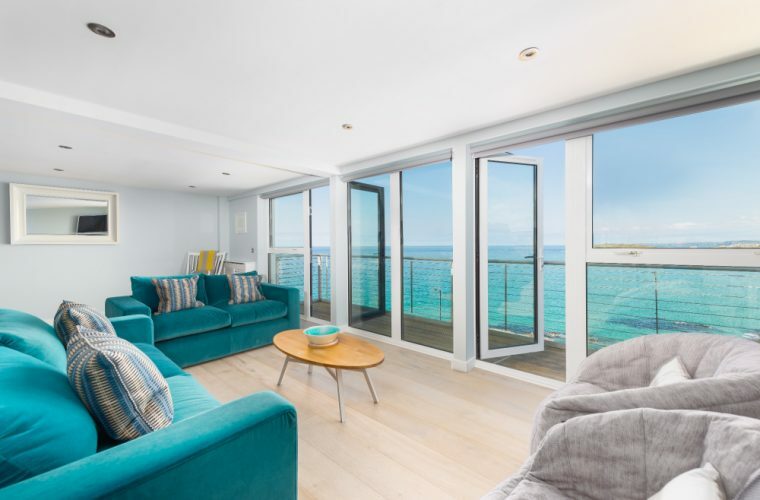 With an open plan living space overlooking the world-famous Fistral beach, 270 North is a spacious two bedroom apartment. Spending most of their summer holidays at the Watergate Bay Hotel, the client engaged me to re-create the hotel’s relaxed coastal design. On viewing the apartment, I could see the space was in good decorative condition, however the decor needed a refresh. The client wanted a contemporary and luxurious finish without the expense. Between myself and the client, we sourced individual pieces to replicate the designer look at the hotel. By sourcing pieces from online and local shops, we were able to keep costs down. 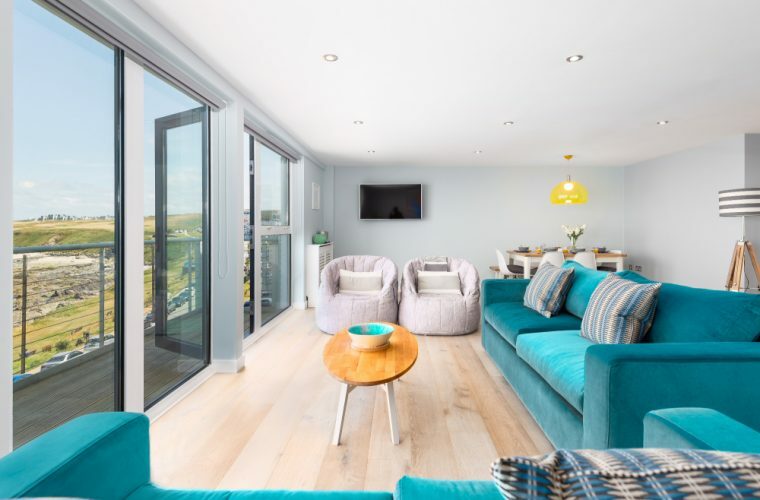 To complement the apartment’s beach-side location, we replaced the dark oak floors in the main living space and bedrooms with a grey limewashed oak. Changing the floors pulled together the design scheme while making the space feel lighter. 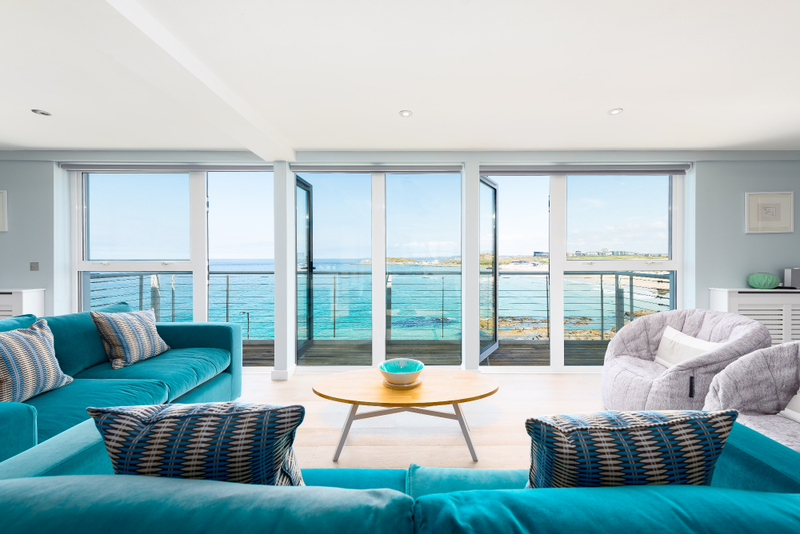 In the open plan living space, I introduced bright, bold colours to reflect the changing colours of the seascape. I used muted grey tones in the bedrooms to create a restful and relaxing space. The pop of yellow, incorporated by the bed spreads, adds a sense of seaside fun to the design. The oval style coffee table in the living space was inspired by the client’s son and his love for surfing. Book a stay at 270 North through Beach Retreats. Go coastal. Get the beach-side look at home.